We are the areas’ only full service jewelry boutique where every aspect involved in jewelry making and servicing is done in-house. Repair, re-sizing, gold and platinum plating, stone setting, precious metal and stone exchange. Custom jewelry design modeled using state of the art CAD software; literally anything you can imagine can be created by our professionally certified CAD designer. The owner is also a certified jewelry making instructor, professionally trained in Europe’s finest precious metal-working institutes. We also have a GIA Certified Gemologist on staff to offer accurate appraisals for all gems and precious metals. If you are a collector of fine timepieces, we have a Certified watchmaker in the BSJ family, able to service even the most delicate Swiss movements, like Rolex and Girard Perregeaux. BSJ has accounts with several watch companies and offer new and pre-owned watch sales as well. The areas only full service jewelry boutique where every aspect involved in jewelry making and servicing is done in-house. We repair any type of jewels and timepieces. Come down to our shop and we can take a look! In our boutique we specialize in crafting and designing a wide array of custom jewels. Using quality software we can create your dreams. With a large array of timepieces from all the major brands, we offer something for every taste. Casio, Seiko and Citizen are just some of the brands that we sell in our boutique. Thrilled with my new necklace! Kristina was able to take a ring that I didn’t wear often and turn it into a piece I will never take off! I absolutely love the design and craftsmanship. She worked with me until I was totally happy. Making this idea a reality. Kristina went out of her way to repair my Tag watch band. She provided excellent , friendly service at a very reasonable price. I am so glad I went to the Black Sea Jewelers. I had lost a gold cross that my grandfather made in Denmark. I wore it forever until the chain broke and I lost the cross. Kristina Groesch of Black Sea Jewelers accepted the challenge of duplicating the cross from pictures. The detailed work was very intricate. The finished product was amazing! Absolutely perfect. I can’t thank Kristina enough for giving me back something that was irreplaceable in my heart. The Groesch’s are a wonderful family and I would highly recommend them to anyone! Thank you, I love my new wedding band it’s so beautiful and goes perfectly with my other ring. I can’t believe it was made out of my old ring. Kristina is awesome, and Jared is too, and her children are adorable!!!! She has done so many things for me, and sometimes I stop in just to chat. She is truly a treasure!!!!!!! I absolutely love this business. If you want a place to purchase jewellery whether that be hand crafted or retail, this is the place to go. It is an incredibly friendly and welcoming environment with excellent customer service. The handmade jewellery is gorgeous. Kristina and Jared created my wedding band. Kristina was confident and joyous about the job at consult, which is why we went with Black Sea Jewelers. My engagement ring is complicated and unique so for the wedding to match and to lie flush with it was a hard job. In the end the ring is more beautiful than I even expected. You two are a great team and I’ll be telling everyone to come to you! Kristina of Black Sea Jewelers brings back life to my Jewelry !! She resized my engagement ring and wedding ring that has not fit for a long time – they looked like brand new !! Also she designed a necklace that turned out to be fabulous. In addition cleaning & polishing other jewelry of mine. 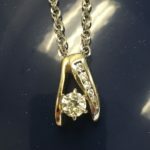 I highly recommend Kristina of Black Sea Jewelers – prices are very reasonable and you will walk out of her shop with a big smile on your face !! I have to tell you that Jared and his wife went out of their way to satisfy me and they will have a customer for life , they are a little out of the way but they make it worth the trip, thank you again Jared. I came here over a year ago to look for engagement rings. They not only helped me find what I was looking for, they gained a customer for life because of their customer service. I also bought my wedding bands there, and as of now they are helping me design another ring for my wife. Jewelry excellence!!!! Kristina and Jared worked with our very unusual requests to make our wedding bands. They are so beautiful! We appreciated knowing that they cared about the little details. But what really makes them deserve five stars is the wonderful personal interaction that we had! This Store Is The Real Deal! This store is the real deal! They have a prefect customer service, above all their jewelry stands out????????? Excellent quality. Very professional, yet a fun atmosphere. One of the few local business owners you can trust in this area. Black Sea Jewelers – I’m so happy I found you! I received my Grand Seiko Watch at a very agressive price!